Every year from September until December cookie companies produce a special festive type of biscuit called ‘pepernoten’. This is because of a Dutch holiday called Sinterklaas (ST. Nicholas). Pepernoten doesn’t really have an international term, the term that comes closest is ‘gingerbread cookies’. Pepernoten come in all kind of flavours, from plain pepernoten to a wide range of chocolate covered pepernoten (i.e. dark chocolate, milk chocolate & white chocolate covered pepernoten) and there are even more flavours. You might start to wonder where I’m going with this, and what this has to do with Social Media, well, you’re going to find out. 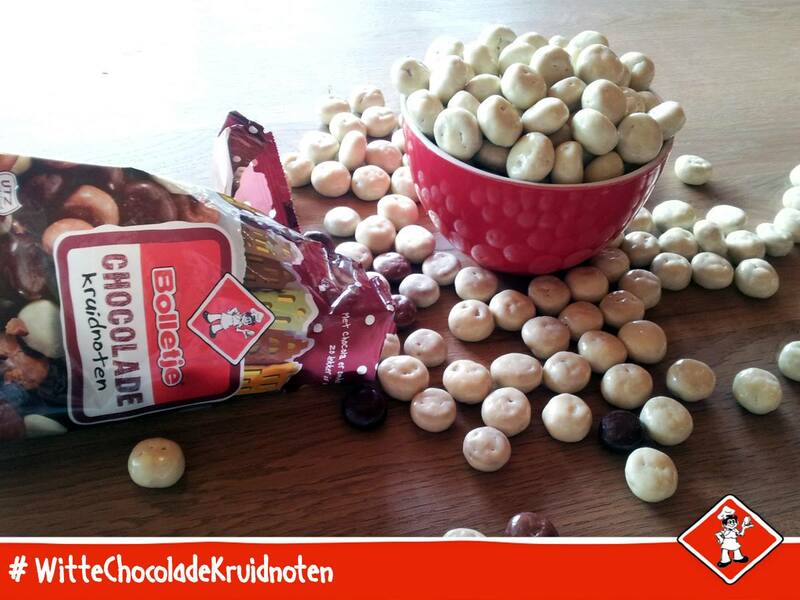 A Dutch company called ‘Bolletje’ is a well-known cookie factory that also bakes pepernoten. At Bolletje one can buy a bag of just plain pepernoten, or a bag of a mix of the chocolate ones (i.e. dark, milk & white chocolate pepernoten combined) or even bags with truffle flavoured pepernoten. In my family, everyone prefers the white chocolate covered pepernoten over all the other flavours. Too bad for us, because it is not possible to ‘just’ buy a bag of white chocolate covered pepernoten, they’re always mixed together with the milk and dark chocolate ones. Well, maybe the wait is finally over because last week, two Dutch Bolletje ‘fans’ asked Bolletje, via Facebook, if they could start producing bags of only white chocolate covered pepernoten. Bolletje replied saying that they could start producing bags of only white chocolate covered pepernoten, but they’d only do it if there’d be sufficient support, say something like 200.000 likes. Just like the ‘fly2Miami’ action, the ‘bags of white chocolate covered pepernoten’ campaign started. The two fans are trying to get the total amount of likes on the Facebook post in picture 2 up to 200.000. If they get there, Bolletje promised to produce the bags. 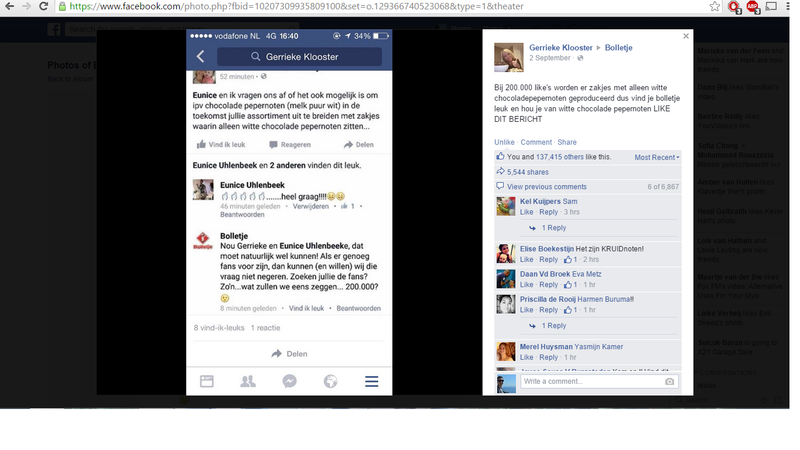 I understand that Bolletje has to have sufficient consumers willing to buy the bags of only white chocolate covered pepernoten to make it profitable, but is liking a Facebook post the same as saying that one will buy the white chocolate only bags? Is Bolletje taking a risk producing the bags (if the post gets enough likes), or will this implantation create a massive profit increase? Do you think that this strategy would be as effective on other social media platforms such as Twitter or Instagram? If you ask me, I think this campaign will be beneficial for Bolletje. If one looks, for example, at other posts on Facebook by Bolletje, they usually get a few hundred likes, but this post has already gotten over 135.000 likes. So by this campaign, Bolletje got as wider audience-range, and we might finally get bags of white chocolate covered pepernoten by Bolletje!! Every like gets the fans closer to the bags of white chocolate covered pepernoten, everyone can make a difference so click here and raise the amount of likes ;)! This entry was posted in Uncategorized and tagged #socialmedia by remylesuis. Bookmark the permalink. I think that it’s just one of the biggest advantages for company of social commerce, that is, the company can reach to their customers more timely. In the past we used to see that there was mailbox hanging by the door of a shop saying ‘Please leave a message for us to improve our serivice’ blablabla but these days people can do it online whenever they want and whereever they are. I don’t think that Bolletje is taking a risk, to produce something new based on the likes they got on FB, if Bolletje can sets a reasonable standard. It may rely on some marketing survey so that the company can decide a number correctly. The number can’t be too high, and it may base on the past sales statistic. If the likes reach such level, it will, to some extent, show the potential sales and help the company to decide how many bags to produce. And what’s more, such campaign will also help advertise the brand, and those who may want other flavors will also get to know the brand. And I think FB and Twitter may be better places for such things, since Instagram doesn’t directly show what your friends and the friends of your friends are doing, so it may not be enough to spread the information in a short time. Maybe next time we can try to change something in this way. Interesting post. The ‘pepernoten’ are in the stores for 4 months a year in Holland, I think that’s quite a long time for a biscuit which is especially for the celebrating of ‘Sinterklaas’. I think every Dutch person will know the struggle with the white ones and Bolletje will know this either. Maybe they were waiting for this way of social media attention? Normally when this kind of biscuits come in store in September, most of the people think: Ohh no, it isn’t that time of the year. Let’s wait for a few weeks/ months.. With this social media hype, a lot of people can’t ignore their tummy anymore and will buy it. At the moment, the Facebook page has more than 200.000 likes. For example: I don’t liked the page but it has appeared for many times in my timeline. Almost every news paper and web-page has written about it. The white ‘pepernoten’, and therefore Bolletje, are attention overload. I think it is very smart and will definitely be beneficial! Nice blog! I think this will be beneficial for Bolletje too. This campaign generates great free marketing for the company, which really puts them in the spotlight on social media. With such a large firm showing they really listen to their customers Bolletje creates customer engagement and thus a very positive feel to the brand. So it’s a win-win situation: free publicity for Bolletje and almost certainly white chocolate covered kruidnoten for the consumers. And even if the company would make a small loss providing this product, it’s a seasonal cookie. Bolletje produces so many popular cookies (the Easter chicks are my personal favourite! ), breakfast products and sweet and salty snacks that a possible seasonal loss can be easily made up for by the profit on other products. So it’s worth the try in my opinion. Somewhat unfortunate for Bolletje: the Jumbo supermarkets already sell their own brand of white chocolate covered kruidnoten and posted a reaction/ad on Facebook saying: “Hey Bolletje, we already have bags of white chocolate covered kruidnoten!” (I don’t know whether they taste same, cause I personally don’t like kruidnoten that much, but it’s smart move of Jumbo).